This entry was posted on Friday, December 29th, 2017 at 10:13 AM by Rachel Choi	and is filed under Fun Ramblings. You can follow any responses to this entry through the RSS 2.0 feed. You can skip to the end and leave a response. Pinging is currently not allowed. This is my year to “stitch up my stash”. I am determined not to buy any more yarn except just what I need to go with what I have to finish a project but I am going to try to make do with what I have. Believe me, I have way too much yarn for any one person. I was diagnosed early this year with rheumatoid arthritis along with the beginnings of cataracts. The writing is on the wall-I have a limited number of years to do the things I love best before I can’t do them at all. I know that cataracts can be surgically removed but I remember my mom struggling to see her artwork prior to her cataracts being ready to remove-perhaps things have changed since then but I dread it. Then of course there is the RA for which there is no cure. I am already having issues with my hands so I don’t know how much longer I can crochet. So by 2019, I should have used up a good portion of my stash and my resolution for that year will be to only buy what I need right now and not stock up at every sale. That will be hard to do but not having so much sitting here waiting for me to stitch it will be nicer. 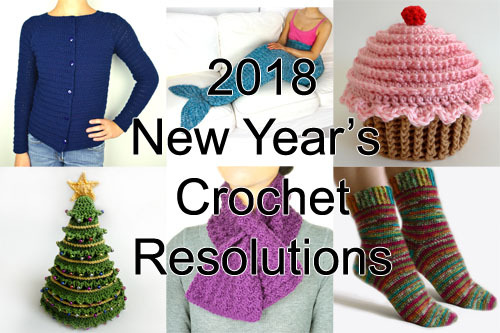 My crochet-related goal for 2018 is to reduce my yarn stash by half.